This trouper had glaucoma and spent several months patiently getting eye drops from us before having both eyes removed. Since Gunner was already partially blind from the glaucoma, he knows how to identify a new person by sniffing them and then he’s eager to make new friends. He adapts to his environment remarkably quickly, racing around the play area as if his vision was perfect. We even have a ball with bell in it that Gunner likes to play with. 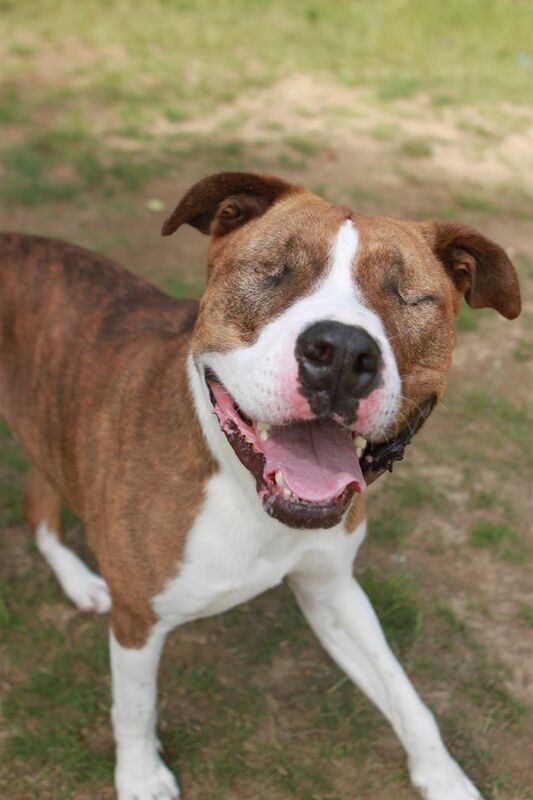 Shelter volunteers say this pit bull is playful, charming, sweet, gentle ‘¦ you get the idea. He’s a strong boy and, because he is blind, he’ll need a fully fenced yard. At about four years old, Gunner has plenty of loving years to spend with a special person (and he’s okay with cats). You can also email Linda Dygert for more information at lindadygert@gmail.com. The shelter requires all members of the household to meet prospective adoptees. We do home checks, but for those of you who live outside of the county, you’ll simply need to bring photos of your home, yard, and fence. Adoption fees are $110.00 for dogs younger than ten years old and include micro-chipping and registration.